A key dimension of projects and events organised by the Work Futures Research Centre at the University of Southampton has been an ongoing engagement with different user groups in relation to employment change, seeking to shape policy and research agendas and to disseminate research findings. 2015, for example, saw the organisation of a policy dialogue event, Gender equality at work, held in June at Portcullis House, Westminster. The symposium was a follow up to a March 2013 panel discussion (also held at the House of Commons) interrogating the ways in which policy interventions might operate to make a difference to gender inequalities in waged labour. Another major event hosted by the Work Futures Research Group in 2015 sought to turn a more locally-focused lens onto patterns of employment change. A key aim was to bring together academics and practitioners at an explicitly interdisciplinary workshop entitled Work, gender and generation. 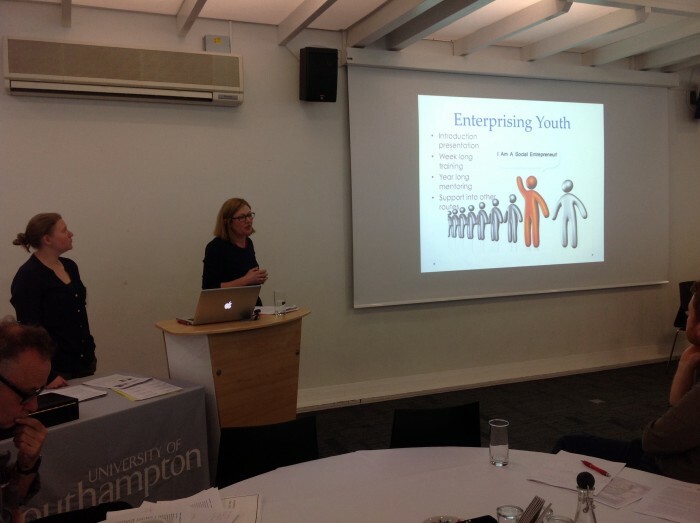 Held at the University of Southampton on 8th May 2015, four panels explored the local context of transformations in work and employment. An opening session investigated employment and training opportunities for young men and women across the local labour market, whilst a second panel reflected upon the specific employment contexts of the creative industries. A third panel considered the experiences and labour market status of social care staff, with a particular focus on youth training in and for the sector. The final session of the day examined aspects of a specific labour market transition from military to civilian work. Participants included academics working on youth training and skills development; local college educators who run apprenticeship programmes; creative industry academics and researchers based in both universities and local authorities; academic analysts of the social care sector; and career advisors working for military charities. Cross-cutting themes included ways in which divisions of labour at times may appear to shift whilst at other times they remain robust. For example, although certain factors have led to the increased involvement of strongly qualified male migrant workers in social care, the current workforce as a whole is most likely to be young and female, with relatively lower qualification and education levels. A further point of connection across the panels was an interest in the decision-making processes of individuals as they move into and through different parts of the labour market. From a policy perspective, panellists and audience participants underscored the importance of understanding job transitions in a holistic fashion. That is, if interventions to support education and training do not connect with labour market policies, young people will be left with ‘training’ or ‘education’ but without jobs; or alternatively they may achieve entry into low paid work but will be left without the possibility of career development. Examples of mentoring and support programmes, both formal and informal, were cited as important within the creative industries and also were emphasised by those working for military charities. As a result of the workshop, Rebekah Luff and Charlie Walker are pursuing their cognate interests in employment in the social care sector and the development of apprenticeships with a research bid to the charity Abbeyfield, which, if successful, will allow them to examine the impact of apprenticeships on social care provision and the prospects of social care employees within the Southampton area. The event was organized by Rebekah Luff, Suzanne Reimer, Silke Roth and Charlie Walker.